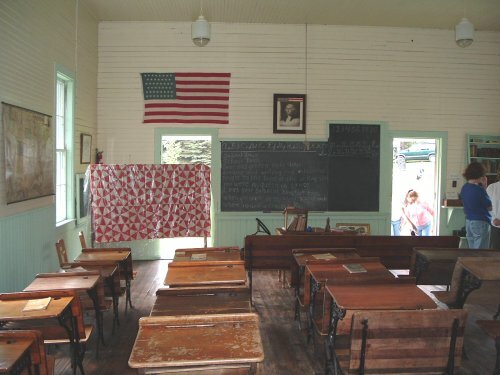 The Daggett Historic One Room School was built on this original site in 1868. It was built to replace the first small log cabin school that was located near the main road in Daggett. At the middle of the 19th Century, Daggett or Daggett’s Mills as it was then called was a flourishing community, with many new settlers, so a new and larger school was a necessity. 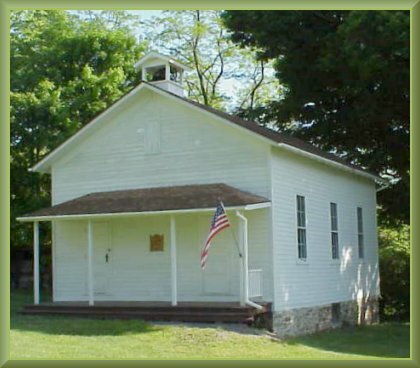 The school is located just off of State Route 549, on the Switchback Road in the Village of Daggett, PA.
One teacher taught all, first through eight grades, with approximately twenty or thirty students in attendance, depending on the population of the town at the time. Later in the first part of the 20th Century a special teacher was hired to instruct music at the school one hour a week. This teacher traveled, to all the rural schools in this area of Tioga County teaching music, through the week. An interesting project that the earlier students accomplished was to plant ten maple trees along the road in front of the school. Some of these trees still stand and add beauty, as well as shade to the grounds. When the school closed in 1954, The Daggett United Methodist Church purchased the property for a larger church parking area. For a few years the school was occasionally used for Sunday school, Boy Scouts, and a few community functions but very little up keep was done on the property from 1954 until 1990. By then the porch had rotted, the roof was leaking and in need of repair. The stone foundation had partially caved in, the exterior badly needed painting, and trees and brush had grown up around the building. In 1990 a womens service club was organized in Daggett named the FAN (Friends & Neighbors) Club, and along with other volunteers in the community banned together to try to restore the deteriorating school. By the end of 1991 with much help from community volunteers, a new porch had been built, the foundation repaired, windows fixed, and two/thirds of exterior had been painted one coat. In 1992 volunteers replaced the roof, and more paint was applied to the exterior, making a vast improvement to the school. In 1993 the interior was repaired and repainted, and restored as it was prior to 1954. The school now looks better than it has in many years. In 1995 a resident of Daggett and alumni of the former school rebuilt the Belfry. With the help of a crane from a local contractor, and many community volunteers the original school bell was installed on the roof in working condition, and toils when ever the bell rope is pulled. Numerous residents still reside in the Daggett area that attended the school. 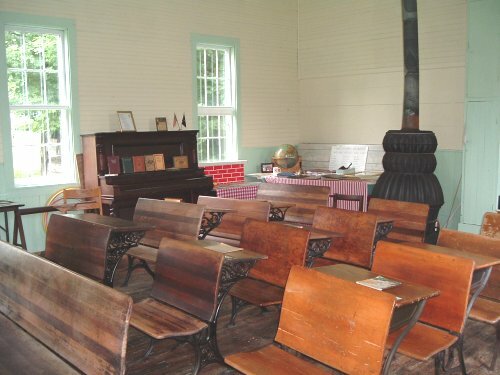 Many have been helpful with donations of artifacts of interest and also relating, what it was like to attend a one room school. An authentic black board, George Washington's picture, and a US flag with 46 stars hang on the wall. Some of the original desks, a map case, dictionary with stand and the old stove, are among many of things of interest donated and now in the school. At present there is no electric or heat in the building so visits are best in spring, summer, or fall, restrooms facilities if needed are available at the church next door. Children as well as adults are welcome, as the exhibits are of interest to everyone. Appointments to visit the school may be made by calling Dorothy Wilber at 570-537-2905 or Marion Myfelt at 570-537-2875. Looking to the front of the schoolroom. 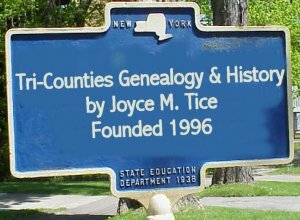 I would like to commend you for the great job you have done with the Tri-County Genealogy & History web sites. I am presently the secretary of the Daggett F.A.N. (Friends & Neighbor's) Club in Daggett, and our organization is one of the major supporters to help restore this one room school listed on this web page. I an attaching our revised brochure of the school and its history, could you to add it, to the web site? Our club also sponsors the Annual Daggett Community Days held in August each year, and features the school which is open for tours, antique cars, music, chicken barbeque, and old fashion home made ice cream. If you would like more information on the school or the Community Days, you can contact me via e-mail or Dorothy Wilbur, F.A.N.Club President at tel 570-537-2907, Box108C, RR-2 Millerton, PA.